Those employed in North America’s real estate industry are well aware Toronto is famous for its condo-fuelled boom. The big question for those inside and outside the Toronto market has been for some time just when will the party end as the construction cranes are trucked off to another fast-developing city? According to George Carras, president of RealNet Canada Inc., the GTA’s high-rise party is over. But the good news? Another one party is just getting started. “I would say that it is the end of GTA 2.0, but it is actually the end of the beginning for housing in the GTA,” he told attendees of the Land & Development conference in Toronto last week. His premise goes like this: The intensification policies put in place in 2005-06 that spurred downtown condo development have done their work, witnessed by the shiny forest of condo towers girding the city’s waterfront. With the foundations laid, Carras does not expect the development to cease any time soon. Toronto is expected to add, and house, another 2.4 million people in a little over two decades or, viewed another way, drop Vancouver’s population into the GTA. In reality, the up not out development drive has been going on for a long time; we just haven’t noticed it, he said. Canada already boasts the most geographically concentrated population in the OECD at 82% (just ahead of Australia at 81%) and well ahead of the U.S. (51%). Despite having the world’s second-largest landmass, most of us are huddled along Canada’s southern border and the top five cities account for 40% of our total population. 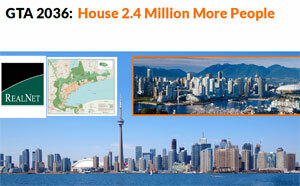 That’s driven big-city growth 19% in Toronto and seven per cent in Vancouver from 2001-11. It shows up in high-rise housing starts, up 38% for Toronto and 50% in Vancouver over that same 10-year span. Carras points out that the geographic squeeze Vancouver is in between the ocean and mountains meant that it had no choice but to grow up rather than out with construction of multi-family homes far outpacing single-family builds. Compared to Vancouver, Toronto today finds itself about 15 years behind the urban intensification trend. Toronto has no actual mountains pushing construction up rather than out, but it has “policy mountains” favouring intensification that produce the same thing the North Shore Mountains do to Vancouver. Following the money, he found that nearly one-half (46% ) of high-rise sales land sales in the GTA in the first quarter of 2014 are focused on high density development in the 416 downtown core. • To keep condos affordable, they are getting smaller. This year, average condo size hit an all-time low (797 square feet) while prices hit a high ($548/ sq. ft.) Rising land costs and development costs mean condos will likely continue to shrink. For those who wonder where low-rise and high-rise home prices are going to go in the GTA, again, Carras said look to Vancouver. Today the price gap is about $250,000, or about where the Pacific coast city’s gap was 10 years ago. The GTA, in other words, is a condo market in terms of new home inventory. Given the GTA 3.0 scenario, future choices for the average GTA resident really come down to just three: up, in or out, Carras concluded. “You have to move up, and that means you have to embrace the notion of intensification in urban living and sacrifice size, or you are going to have to move out and look to places like Guelph, Kitchener-Waterloo and others and sacrifice your time in order to make those thing work. Those employed in North America’s real estate industry are well aware Toronto is famous for its condo-fuelled boom. The big question for those inside and outside the Toronto market has been for some time just when will the party end as the construction cranes are trucked off to another fast-developing city?